I am a member of the WBAI because I believe in the advocacy of women both inside and outside the legal community. In addition, I strive to enhance my relationships with attorneys through the networking programs offered by the WBAI which are unique and developed based on the interests of the membership. I have gained so much from the WBAI on both a personal and professional level through friendships and business relations. 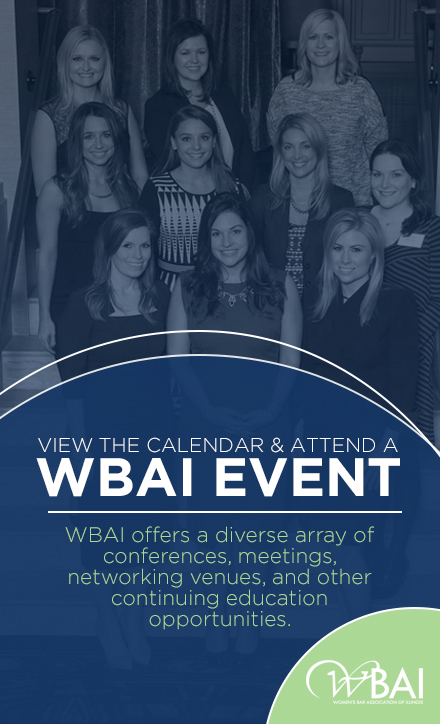 I hope to continue to advocate and encourage female attorneys seeking a professional organization within the WBAI. I am very excited for this upcoming bar year working with President Karie Valentino. I will be serving as the Recording Secretary as an Officer on the Board of Directors. The WBAI has so many fun and fresh member benefit offerings as well as legal and professional development opportunities for the WBAI membership to explore. There is something for everyone! I love history and architecture, especially the prairie style design made popular in Chicago. My husband and I are currently renovating/restoring a prairie style house we purchased as our family home. We are doing as much of the work ourselves as it is our labor of love.